President Donald Trump recently said that the U.S. economy is “stronger than ever before” and points to his tax plan as one of the major reasons why.1 But the fact is that workers are not getting ahead in the Trump economy. 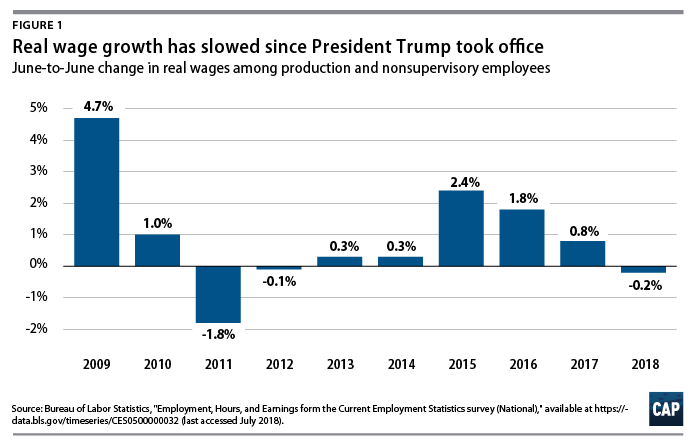 Official data released in recent weeks have shown that workers’ wages are flat or even slightly down, in real terms, over the last year.2 These data fly in the face of many tax plan boosters who have claimed that the bill’s passage has already been a boon to middle-class workers. 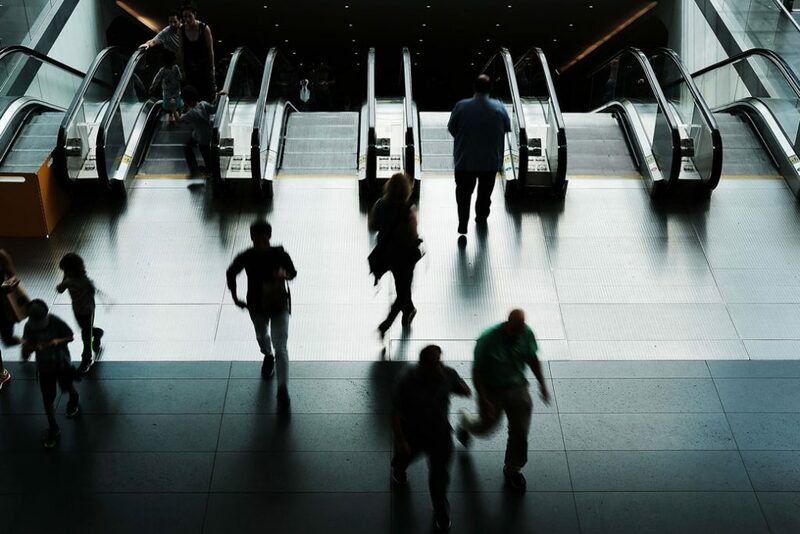 This Friday, the U.S. Department of Commerce will release its first estimate of the nation’s economic output in the second quarter of 2018. For a number of reasons, second-quarter gross domestic product (GDP) growth is expected to be relatively strong. 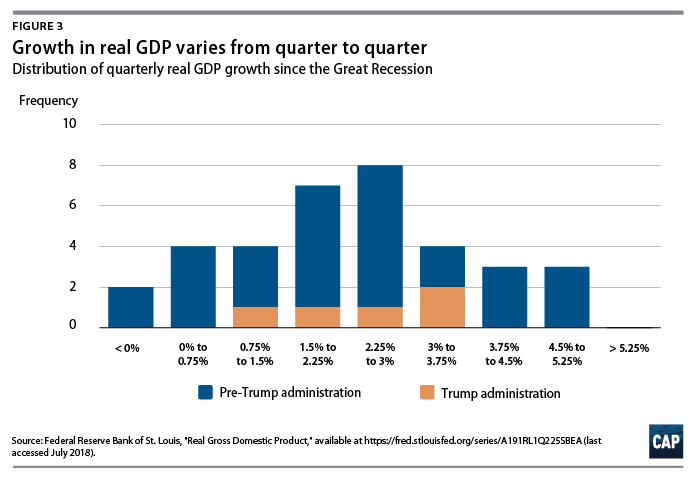 But one quarter’s GDP estimates hardly indicate that the economy is experiencing the sustained, broad-based growth that tax cut proponents promised would happen. Indeed, as the wage data show, the economy’s gains have not trickled down to regular workers. In fact, President Trump’s policies have only made it harder for them to get ahead. GDP growth is the biggest-picture view of the economy; it’s important for macroeconomists who focus on long-term shifts in what the U.S. economy produces. GDP, however, is only one measure of economic progress, so its effectiveness at measuring workers’ well-being is limited. In the modern economy, benefits are shared unequally. As economic benefits have gone increasingly to those at the top, overall economic growth tells us less than it once did about how the living standards of all Americans are changing. To be sure, economic growth is an important goal, but it’s naïve to ignore the growing disconnect between changes in economic output and living standards for the vast majority of workers—especially when there are much more applicable measures of how workers are faring. That hasn’t happened. In fact, when adjusting for inflation, wages have actually fallen this year. It’s not that wages haven’t ticked up at all—they have, in part due to increases in the minimum wage.5 But even with slightly faster nominal wage growth, workers have lost ground because inflation has picked up more than wage growth. With reports pointing to idiosyncratic factors playing a potentially large role in the second-quarter GDP—this brief will discuss soybean exports later—it’s worth taking this figure with an extra grain of salt. It’s also worth noting that while we’re waiting for GDP data, wage data already exists—and it’s moving in the wrong direction. For regular working families, real wages are what matter. Stagnant wages are not what the proponents of the tax cut said would happen. They predicted that corporate tax cuts would ultimately translate to higher wages for U.S. workers. The White House estimated that the corporate tax cuts would boost the average family’s wage and salary income by $4,000 after a few years.12 That’s $4,000 after adjusting for inflation, over and above any increases they would have seen over time in the absence of the tax bill. But so far, real wages are flat or slightly down since the tax bill passed. But tax cut proponents have not only stuck to outlandish promises about future wage growth—they have also claimed that workers are already big winners from the tax law. White House economist Kevin Hassett has recently claimed that “wages have gone up faster than we thought” and implied that the $4,000 promise has already been fulfilled for many American families.16 The actual data on real wages belie those claims. The sorry state of wage growth in the U.S. economy should not be news to anyone by now. But as the longest economic expansion in modern history continues through the Trump administration, economists are growing increasingly concerned about an economy that routinely delivers healthy profits to big business without raising wages for workers.22 It’s not surprising that a comprehensive, decadeslong anti-worker agenda could stack the deck in favor of corporations. And this year’s wage data have made it crystal-clear that that’s exactly what has happened. If workers can’t get a raise with an economy near full employment and 93 months of uninterrupted job growth, it’s not clear if they ever will. These outcomes are not the result of the invisible hand, but of a market that has been set up to favor the wealthy. 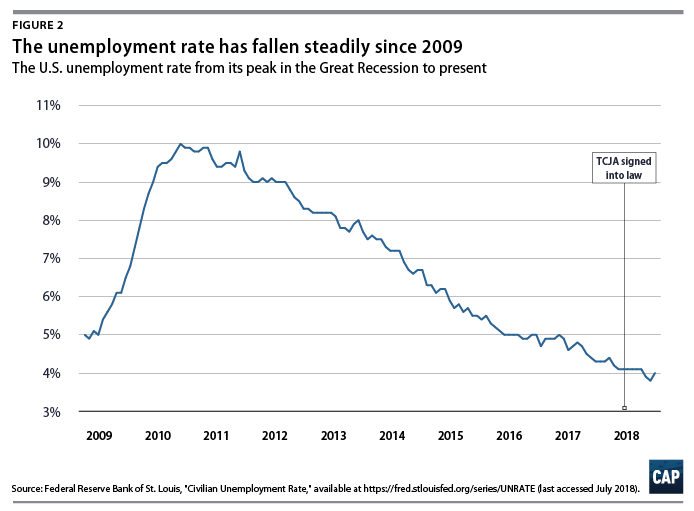 There are concrete steps policymakers can take to reverse this trend, but 1 1/2 years in, this administration has consistently taken sides against workers. Until the government stops tipping the balance of power toward corporations, GDP growth is increasingly becoming just a number for most workers. It is critical to put one quarter’s GDP estimate in context. While mainstream public and private forecasters project that the U.S. economy will grow about 2 percent per year over a long-term horizon, the Trump administration claimed that its policies would boost economic growth to 3 percent over the long-term. During the 2016 campaign, Trump even promised sustained 4 percent growth or higher.27 If GDP growth reaches those levels for one quarter, it by no means indicates that growth will continue at that level in perpetuity.28 In fact, since 2009, GDP grew faster than 3 percent during 10 quarters, including four quarters of growth above 4 percent. In the third quarter of 2014, it grew at 5.2 percent.29 None of these strong quarters portended a permanently higher growth path. GDP is not a measure of Americans’ well-being, let alone that of middle- or working-class families. While GDP measures overall output, it does not reveal who benefits from expanding output. For example, GDP is one-third bigger in real terms than it was in 2000, but real median household income is only barely above where it was at that point.37 The gains have accrued disproportionately to high earners and owners of capital—America’s rich, in other words. The flat real wages that U.S. workers have experienced over the past year signal that workers are not getting a larger share of the economic pie. Michael Madowitz is an economist at the Center for American Progress. Seth Hanlon is a senior fellow at the Center.